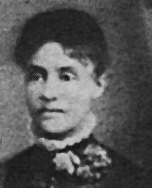 Alice Rowan Johnson taught school in San Bernardino in 1890. She married Frank Johnson on Christmas Day, 1892. On December 24th, 1892 the Redlands Citrograph reported: “A wedding of more than ordinary prominence among the colored people of this city, will be solemnized on Christmas day at the M. E. church. The contracting parties are Frank H. Johnson of Riverside and Miss Alice Rowan of this city. The bride-elect is well known for her intellectual accomplishments, and not long ago carried off honors at the State Normal school — Times Index”. The wedding was mentioned in every paper in the valley. It was one of the most celebrated social events in the San Bernardino black community during the 1890s. After she and Frank married, they later moved to Riverside. Alice taught in Riverside in 1896. City of San Bernardino. San Bernardino Historical and Pioneer Society, 1983. Web. 10 May 2013.